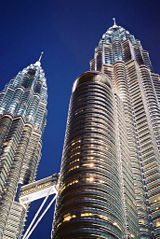 The Petronas Twin Towers, the highest buildings from 1999-2004 and currently the tallest twin towers in the world. A skyscraper is a very tall, continuously habitable building. 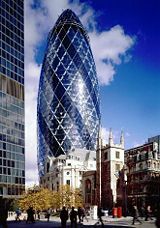 Usually, a building is called a skyscraper if it clearly stands out above the surrounding built environment and significantly changes the city's overall skyline. The structure is expected to be at least 20 stories tall (although the term "skyscraper" was applied to early, 10-storied structures). Apart from that, there is no universally accepted minimum height for a skyscraper. In the United States today, a loose convention draws the lower limit for a skyscraper at 150 meters. Elsewhere, a building that is 80 meters (about 262 feet) tall may be considered a skyscraper, based on its relative impact on the city's skyline. In addition, habitability distinguishes skyscrapers from towers and masts. Skyscrapers are amazing feats of architecture and construction technology. On the one hand, they allow for the expansion of habitable space in urban areas where space is often limited. On the other hand, they are symbolic of human aspirations to reach for ever higher heights, overcoming any obstacles that may come in the way. 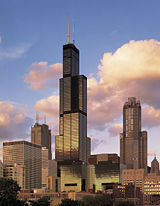 The Sears Tower in Chicago would have been the tallest building in the world if its antennas were included. The Empire State Building and Chrysler Buildings in New York City. Built in 1931 & 1930, respectively, and exemplifying Art Deco architecture, they are among the oldest yet still remain among the tallest skyscrapers in the world. 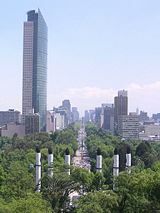 The Torre Mayor in Mexico, is the tallest building in Latin America. 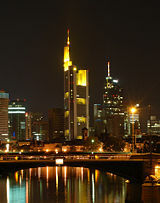 Commerzbank Tower in Frankfurt, currently the tallest skyscraper in the European Union. The Bank of China Tower and the Cheung Kong Center towers in Hong Kong are examples of radical and conservative skyscraper designs. 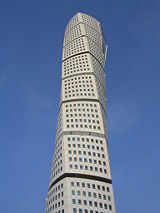 The Turning Torso skyscraper in Malmö, Sweden. 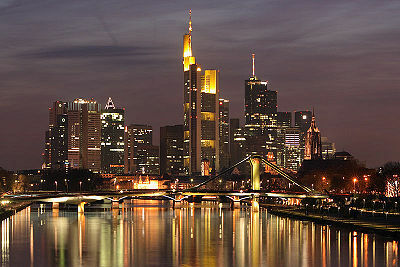 It is the second tallest residential skyscraper in Europe. The tower was completed in 2005. The Emporis Standards Committee defines a high-rise building as "a multi-story structure with at least 12 floors or 35 meters (115 feet) in height." Comparing this definition with the somewhat loose definition of skyscraper noted above, one can say that all skyscrapers are high-rises, but not all high-rises are skyscrapers. An extremely tall skyscraper, particularly one that is taller than 300 meters (1,000 ft), is sometimes colloquially referred to as a supertall. Some structural engineers define a high-rise as any vertical construction for which wind is a more significant load factor than weight is. This criterion fits not only habitable high-rises but also other tall structures, such as towers. Later, architectural historians used a structural definition for the word skyscraper, based on engineering developments of the 1880s that had enabled construction of tall, multi-story buildings. This definition was based on the steel skeleton—-as differentiated from the construction of load-bearing masonry. Philadelphia's City Hall, completed in 1901, still holds claim as the world's tallest load-bearing masonry structure, at 167 m (548 ft). It should be noted that many of today's tallest skyscrapers are built more or less entirely with reinforced concrete. The crucial developments that allowed for the construction of modern skyscrapers were steel, glass, reinforced concrete, water pumps, and elevators. Until the nineteenth century, buildings of over six stories were rare. So many flights of stairs were impractical for inhabitants, and water pressure was usually insufficient to supply running water above about 15 meters (50 ft). Despite this lack of sanitation, high-rise housing dates back to the 1600s in some places. The Romans built apartment buildings sometimes 7-8 stories high. These buildings were unstable and dirty, and they often caught on fire due to careless inhabitants. In Edinburgh, Scotland, a defensive wall defined the city's boundaries. With limited land area for development, the houses increased in height. Buildings of 11 stories were common, and there are records of buildings as high as 14 stories. Many of the stone-built structures can still be seen in the old town of Edinburgh. The oldest iron-framed building in the world is the Flaxmill (also locally known as the "Maltings") in Shrewsbury, England. Built in 1797, it is considered the "grandfather of skyscrapers,” due to its fireproof combination of cast iron columns and cast iron beams. These developed into the steel frame, which made modern skyscrapers possible. It unfortunately lies derelict and needs much investment to keep it standing. On March 31, 2005, it was announced that English Heritage would buy the Flaxmill, so that it could be redeveloped. The first steel-framed high-rise (called a skyscraper based on its structure) was the ten-story Home Insurance Building in Chicago, built in 1884–1885. Although its height is not considered unusual or impressive today, the architect, Major William Le Baron Jenney, created the first load-carrying structural frame. In this building, a steel frame supported the entire weight of the walls, instead of the walls themselves carrying the weight of the building, which was the usual method. This development led to the "Chicago skeleton" form of construction. After Jenney's accomplishment, the sky was truly the limit so far as building was concerned. Another ten-story structure was Sullivan's Wainwright Building, constructed in St. Louis in 1890. It was the first steel-framed structure to have soaring vertical bands to emphasize its height. The United Kingdom also had its share of early skyscrapers. The first building to fit the engineering definition was the then-largest hotel in the world, the Grand Midland Hotel, now known as St Pancras Chambers in London, opened in 1873, with a clock tower 82 meters (269 ft) in height. The 12-floor Shell Mex House in London, at 58 meters (190 ft), was completed a year after the Home Insurance Building and managed to beat it in both height and floor count. 1877, saw the opening of the Gothic revival style Manchester Town Hall by Alfred Waterhouse. Its 87-meter-high clock and bell tower dominated that city's skyline for almost a century. Most early skyscrapers emerged in the land-strapped areas of Chicago, London, and New York toward the end of the nineteenth century. London builders soon found their height was limited, based on a complaint from Queen Victoria—rules that remained in place with few exceptions until the 1950s. Concerns about aesthetics and fire safety had likewise hampered the development of skyscrapers across continental Europe for the first half of the twentieth century. Notable exceptions were the 26-story Boerentoren, built in 1932, in Antwerp, Belgium, and the 31-story Torre Piacentini, built in 1940 in Genoa, Italy. After an early competition between New York City and Chicago for the world's tallest building, New York took a firm lead by 1895 with completion of the American Surety Building. Developers in Chicago also found themselves hampered by laws limiting height to about 40 stories, leaving New York to hold the title of tallest building for many years. New York City developers then competed among themselves, with successively taller buildings claiming the title of "world's tallest" in the 1920s and early 1930s. The Chrysler Building was completed in 1930, followed by the Empire State Building in 1931. The latter became the world's tallest building for forty years. 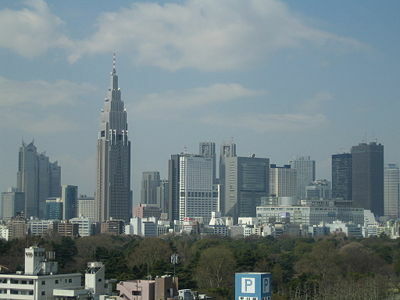 From the 1930s onward, skyscrapers also began to appear in Latin America (São Paulo, Caracas, Mexico City) and Asia (Tokyo, Shanghai, Hong Kong, Singapore). Immediately after World War II, the Soviet Union planned eight massive skyscrapers dubbed "Stalin Towers" for Moscow. Seven of these were eventually built. The rest of Europe slowly began to permit skyscrapers, starting with Madrid in Spain, during the 1950s. Finally, skyscrapers also began to appear in Africa, the Middle East, and Oceania (mainly Australia) from the late 1950s and early 1960s. As of this writing, New York City has 195 completed free-standing buildings over 492 ft. (150 m) tall—the largest number of such structures in the world. If one counts individually the multiple towers that rise from a common podium (as in buildings that rise several stories as one structure, before splitting into two or more columns), Hong Kong has 221 towers that exceed this height—the most in the world. The number of skyscrapers in Hong Kong will continue to increase due to a prolonged high-rise building boom there, based on demands for additional office and housing space. A new building complex in Kowloon contains several mixed-use towers (hotel-shops-residential) and one of them will be 118 stories tall. Chicago's skyline was not allowed to grow until the height limits were relaxed in 1960. Over the next fifteen years, many towers were built, including the massive 442-meter (1,451-foot) Sears Tower, leading to its current number of 90 buildings over 492 ft. Chicago is currently undergoing an epic construction boom that will greatly add to the city's skyline. Since 2000, at least 40 buildings at a minimum of 50 stories high have been built. The Chicago Spire, Trump International Hotel and Tower, Waterview Tower, Mandarin Oriental Tower, 29-39 South LaSalle, Park Michigan, and Aqua are some of the more notable projects currently underway in the city that invented the skyscraper. Chicago, Hong Kong, and New York City, otherwise known as the "the big three," are recognized in most architectural circles as having the most compelling skylines in the world. Other large cities that are currently experiencing major building booms in skyscrapers include Shanghai in China and Dubai in the United Arab Emirates. Today, skyscrapers are an increasingly common sight where land is scarce, as in the centers of big cities, because of the high ratio of rentable floor space per area of land. Skyscrapers, like temples and palaces in the past, are considered the symbols of a city's economic power. The Flatiron Building, standing 285 feet (87 m) high, was one of the tallest buildings in the city upon its completion in 1902, made possible by its steel skeleton. It was one of the first buildings designed with a steel framework, and to achieve this height with other construction methods of that time would have been very difficult. That same year, the Chrysler Building took the lead as the tallest building in the world, scraping the sky at 1,046 feet (319 m). More impressive than its height is the building's design, by William Van Alen. An art deco masterpiece with an exterior crafted of brick, the Chrysler Building continues to be a favorite of New Yorkers to this day. The Empire State Building, the first building to have more than 100 floors (it has 102), was completed the following year. It was designed by Shreve, Lamb and Harmon in the contemporary Art Deco style. The tower takes its name from the nickname of New York State. Upon its completion in 1931, it took the top spot as tallest building, and at 1,472 feet (448 m) to the very top of the antenna, towered above all other buildings until 1973. When the World Trade Center towers were completed in 1973, many felt them to be sterile monstrosities, although they were the world's tallest buildings at that time. Over time, most New Yorkers became fond of the "Twin Towers." The September 11, 2001 terrorist attacks on the towers (and elsewhere) led to horror and great sadness for the loss of life and the buildings. 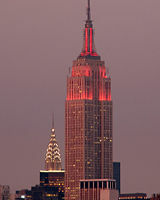 The Empire State Building is again the tallest building in New York City. Freedom Tower, currently under construction in New York, will become the centerpiece building of the new World Trade Center complex planned for Lower Manhattan. The tower, which will occupy the northwest corner of the former World Trade Center site, will reach a height of 541 meters (1,776 ft), making it the tallest building in the U.S. when completed in 2010. However, the Chicago Spire, projected to be completed in the same year, is expected to stand at 610 meters (2,000 ft). Currently, the Burj Dubai is being constructed in Dubai. Its exact future height is kept secret, but it is expected to become at least 800 m (2,625 ft) high, making it the tallest building in the world. 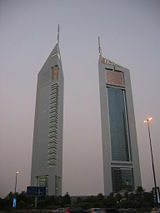 The Burj Dubai is to be completed in June 2009. "What is the chief characteristic of the tall office building? It is lofty. It must be tall. The force and power of altitude must be in it, the glory and pride of exaltation must be in it. It must be every inch a proud and soaring thing, rising in sheer exaltation that from bottom to top it is a unit without a single dissenting line." "A skyscraper is a boast in glass and steel." "The skyscraper establishes the block, the block creates the street, the street offers itself to man." "Manhattan has no choice but the skyward extrusion of the Grid itself; only the Skyscraper offers business the wide-open spaces of a man-made Wild West, a frontier in the sky." "Architecture is the alphabet of giants; it is the largest set of symbols ever made to meet the eyes of men. A tower stands up like a sort of simplified statue, of much more than heroic size." With tall distinctive skyscrapers, these panoramic images show how skyscrapers are able to affect, define and transform cities into skylines. Panorama view of the Hong Kong Skyline. The Skyline of Toronto, Ontario, Canada, from Lake Ontario. New York City and the Empire State Building from the Rockefeller Center observation deck. Seattle, Washington from Puget Sound. 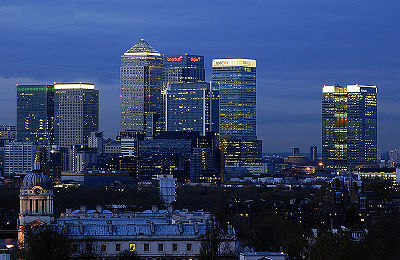 Skyline of Canary Wharf, London. ↑ Emporis, Data Standards: Real Estate. Emporis. Retrieved August 19, 2007. ↑ en.structurae.de, Home Insurance Building. Retrieved September 3, 2007. ↑ Project Chicago, Wainwright Building. Retrieved September 3, 2007. ↑ Emporis, New York City, High-rise Buildings (completed). Retrieved August 19, 2007. ↑ Emporis, Hong Kong, High-rise Buildings (completed). Retrieved August 19, 2007. ↑ Emporium, Chicago, High-rise Buildings (completed). Retrieved August 19, 2007. ↑ World Trade Center, Building Features. Retrieved March 19, 2007. ↑ Emporis, International Building Database. Retrieved August 20, 2007. SkyscraperPage - Technical information and diagrams. Construction photos of Burj Dubai (World's tallest by 2009). This page was last modified on 23 September 2015, at 15:18.